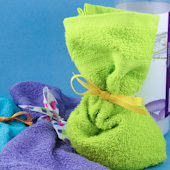 In this project, you'll sew up a nifty bag for your bath from a washcloth and ribbon. Put soap or bath salts inside and relax in a sudsy tub of warm water. But don't stop there! 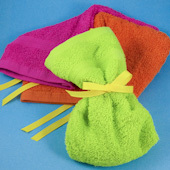 The bath bags also double as bath mitts for the kids. Use the ribbon to secure the bag on a child's wrist. Bath bags are a great gift, too! Make some to have on hand, then just add some pretty soaps or a jar of your favorite bath salts for the perfect gift. Related crafts: Make handmade soaps to go with your bath bags—see how in the Bath Buddies and Layered Soaps craft projects. For more washcloth crafting fun, see the Washcloth Bunny craft project. 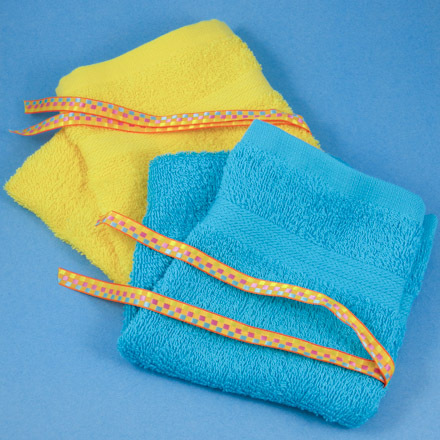 Pre-wash and dry washcloths—one per bath bag. Cut an 18" length of coordinating ribbon for each bath bag. Tip: It is best to use woven ribbons like grosgrain. Printed ribbons tend to fade, and many are not washable. Always test printed ribbons first. Fold the washcloth in half, right sides together. Tip: If the washcloth has borders at the top and bottom, fold the washcloth lengthwise so that the borders are folded. Take the 18" length of ribbon or lace and fold it in half. Place it (tails in and fold out) inside the open edge, near the top of the washcloth. Align the fold to the edges of the washcloth. 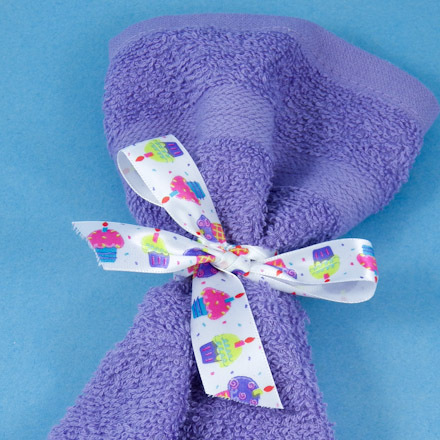 Pin the washcloth's open side and bottom edge—make sure to capture the ribbon! Use your sewing machine to sew the pinned side and bottom end. Make the seam about ½" wide, or use a larger seam allowance if the washcloth has deep hems. Tip: Make sure you sew closed the end opposite to where you put the ribbon! Turn the bag inside out, fill with soap or bath beads/salts, and tie closed with ribbon. Voila! Fun in the tub! 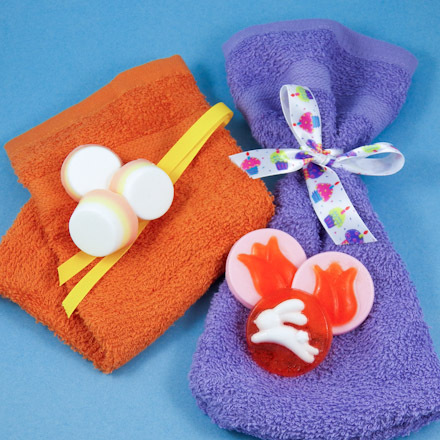 Tip: Bath bags and handmade soaps make a terrific gift! 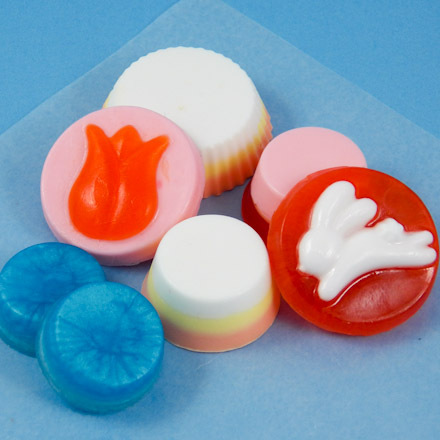 See the Bath Buddies and Layered Soaps craft projects for simple soap-making instructions. 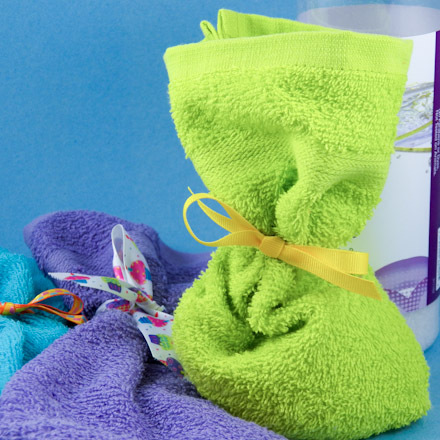 Tip: Make a set of bath bags with a different color for each family member. Thanks to Kathy Johnston for sharing this craft idea with Aunt Annie's Craft Exchange in 1997. Kathy comments, "These make very nice gifts filled with homemade soaps!"